The library welcomes and supports all students. We are dedicated to inclusive service and access for all patrons. If you need an accommodation not listed here, please ask library staff; we can help with research, technology, access to collections, and other services. Contact the Office of Disability Services at 206.934.4183 (Voice or TTY) if you need additional assistance. More information about Disability Support Services can be found on their webpage. See Transportation Services (BE 1143) or visit Student Parking on the website. 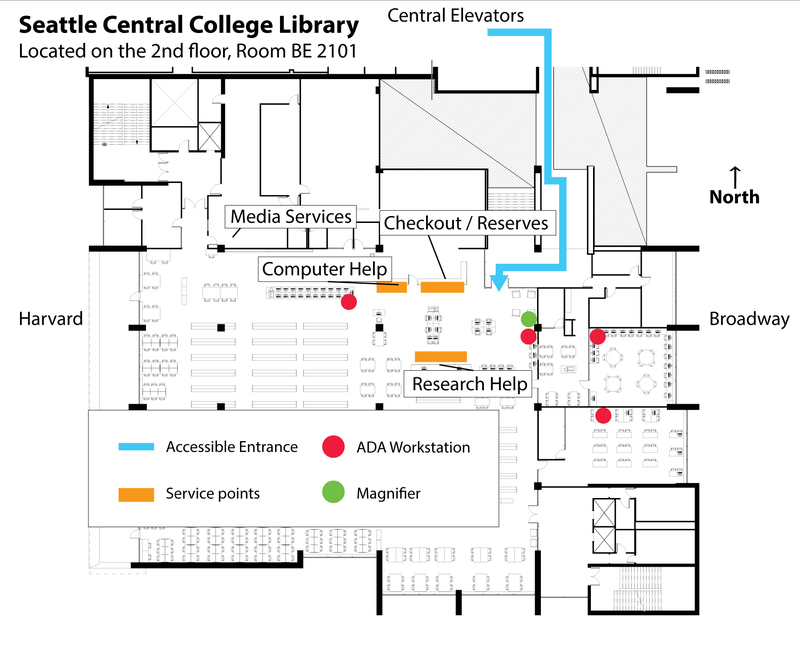 The library is located in the Broadway Edison building, on the second floor (BE 2101) on the south side of the building. Broadway ADA entrance: Enter the main entrance across from the student bookstore and head to the elevators. Take the central elevator up to the 2nd floor. Exit the elevator and head right (south). Proceed down the ramp and around the corner to the library front entrance. Students who need assistive technology software training should contact the Office of Disability Services at 206.934.4183 (Voice or TTY). More information about Disability Support Services can be found on their webpage: https://seattlecentral.edu/campus-life/student-support-and-services/disability-support. The library has four designated ADA computer Workstation with adjustable height tables (see above Technology section for more information). The Women's and Men's restrooms in the library each have one ADA accessible stall. Our group study rooms may be reserved to meet an individual's needs, either by working with the Disability Support Services office, or at the discretion of the librarian. SCC students, staff and faculty can request books be pulled from the shelf and held for 7 days. By clicking Request Item when searching the catalog, circulating books from any of the Seattle Colleges can be ready for pick up at the library Circulation Desk. Click library map to open in new window.